Has it finally happened? Have prepaid debit cards moved from being a distress purchase (once used only by those who couldn't get approved for mainstream debit and credit cards), through acceptability, all the way to exclusivity? At least one company seems to think so, because it's issuing a platinum prepaid product -- made of pure platinum. The Pure + Solid® Platinum MasterCard® weighs in at a minimum of 65 grams (just shy of 2.3 ounces), and costs … wait for it … roughly $38,000. Given that the spot price for platinum closed in New York on July 29 at $1,474 an ounce, you're paying an awful lot -- more than $30,000 -- for the craftsmanship that allegedly goes into making the card, your PriorityPass membership (apparently the only perk) that gives you free access to some airport lounges, and the supposed prestige that comes from owning "arguably the most exclusive card in the world," in the words of the issuer's website. Other than that, you seem to get pretty much the same functionality that comes with any other prepaid MasterCard. Exclusive? Unless we've all gone totally bonkers, your new card could be unique. In July 2014, market research company GfK published its latest review of the prepaid market, and found that 60 percent of Americans had used such a card during the previous 12 months. However, that number included branded gift cards, government benefit cards, payroll cards and student cards, as well as "general purpose reloadable cards (GPRCs)," the ones most of us think of when we talk of prepaid debit cards. Only 16 percent of GfK's sample had used any prepaid card aside from a gift card. People with annual incomes in excess of $100,000 are using prepaid cards at comparable rates to those of less affluent consumers. Relatively high satisfaction rates of about 70 percent are to be found across income groups and generations. How quickly such growth in usage might occur is unclear. Market research company Packaged Facts forecasts the amount likely to be charged to GPRCs is set to increase 17 percent in 2014, and calls its prediction conservative. However, the First Data SpendTrend analysis for June 2014, which measured the spending on different payment media that month compared with the same period last year, found growth of only 4.0 percent. The comparable dollar value of payments on credit cards was up 3.9 percent. Less than two years ago, IndexCreditCards.com warned readers of the dangers of GPRCs, in particular, high costs, sneakily hidden fees, minimal consumer protections and a near-total lack of regulation. Things have changed to some extent since then, but -- while a number of reputable companies are now offering good products -- there is still little to stop rogue players from ripping off consumers. Indeed, it was only on July 21, 2014, that federal regulator the Consumer Financial Protection Bureau began to accept complaints from the public about prepaid products. ...there are no federal laws or regulations that directly protect consumers from hidden fees, liability for unauthorized transactions, or loss of funds in the event of an issuing institution's failure. Nor are there federal rules requiring these cards to provide disclosures of fees, terms, conditions, or dispute resolution practices. Even if you have the luck and persistence to seek out a GPRC issuer that voluntarily offers the same protections and benefits as a bank debit card, you'd still be missing out on a whole lot that credit card users take for granted. Suppose your prepaid debit card were stolen or cloned, and then used illegally. Or imagine you order something online, and it doesn't turn up -- or something's wrong with what's delivered. Even if (and many might not) your issuer agrees to cover your losses, you could have to wait a very long time to get back your money, which, of course, you preloaded onto the card. If the same things happen with a credit card, you can simply refuse to pay the charges. So it's not your money at stake -- and not your problem. And what about rewards? A few GPRCs offer some points or cash back if you buy certain products from specified merchants. But this writer's yet to see a single prepaid deal that compares remotely to the ones routinely offered by rewards credit cards. Finally, many credit cards offer extended warranties or price and purchase protection that can save you serious sums when things go wrong. Try finding such an offering from a prepaid issuer. Those whose credit scores are too low to get approved for proper plastic. Those who can't resist the temptation to run up credit card debt. For pretty much everyone else, it's a no-brainer. 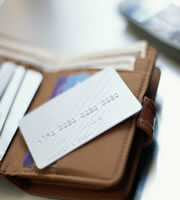 Unless, of course, you find the ultimate bling of that solid platinum card irresistible. 0 Responses to "Prepaid debit cards are no substitute for credit cards"